PES Unviersity Electronic City Campus Intercollegiate fest Maaya 2018, which was held during this Deepavali season was filled with fun and frolic. The fest was inaugurated by hoisting Karnataka flag by Dr. J Surya Prasad, Principal and Director followed by Dollu kunitha. The fest which was held on 10th and 11th November 2018 had more than 1500 participants contesting in various technical, literary, fine arts and cultural events. The stage events witnessed extreme competition and judges appreciated the amount of talent presented by PES University, RVCE, BMSCE, Christ University and other 26 college students. Maaya 2018 was concluded by mega band performance by “Pineapple Express”. 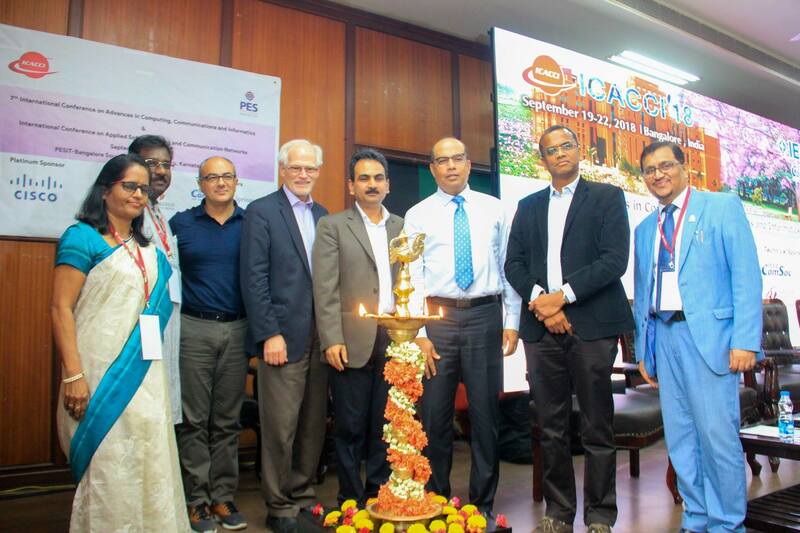 The inaugural ceremony of the 7th edition of the International Conference on Advances in Computing, Communications and Informatics (ICACCI), was held at PES University Electronic City Campus, Bangalore from Sep 19 to 22. The event commenced with the lighting of lamp by a group of dignitaries – Chief guest Dr. Schahram Dustdar, Head of Distributed Systems Group, The TU Wien, Austria, Guest of Honor Dr Thomas M Coughlin, 2018 President-Elect, IEEE USA, Guest of Honor Shri Vinay Parameswaran Nair, Director Engineering, Cisco Systems India and DrSabu M Thampi, Professor, IIIT-M, Trivandraum , Executive Chair, ICACCI. The ceremony was followed by Saraswati-Vandana. Dr Sudarshan TSB, Dean Research, PESU Bangalore formally introduced all the dignitaries on the dais and welcomed the participants, colleagues & students from all over the world. He talked about the scope of ICACCI and how it provides an international forum for exchange of ideas between students and researchers. Prof D Jawahar, Pro-Chancellor, PES University, expressed his gratitude towards ICACCI for choosing PES as host for such a prestigious event. He talked about the vision and the how the “Spirit of PES” guides them to make their vision a reality. Guest of Honor Shri Vinay Parameswaran Nair briefed about the importance of the event and the excellent platform it presents for researchers and students. The ceremony concluded with a vote of thanks by Dr. Shikha Tripathi, Research Head, PES and Organizing Chair of ICACCI. She mentioned the previous conferences and gave a layout of events to come in forthcoming days. 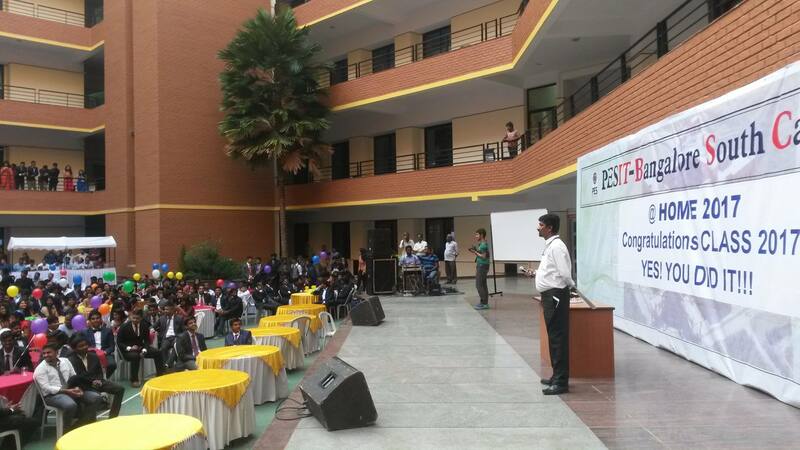 It was time for the graduating students from BE, MTech, MCA and MBA to get to solving problems for the real world. At the event AT Home 2018 the best outgoing students from each department were felicitated. Dr. Surya Prasad, Principal PESIT BSC addressed the gathering. Prof . Sandesh, HOD computer science entertained the crowd by singing. The event was organized by Mr. Varun and team from 6th semester mentored by Dr. S.V.Satish. 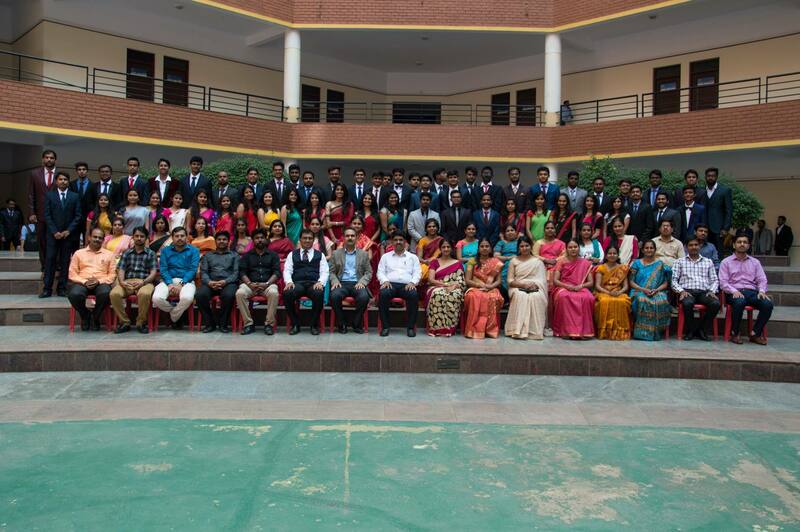 The event of PESIT Bangalore South Campus was held on May 18, 2018. Dream for every engineer is to create something of his own. 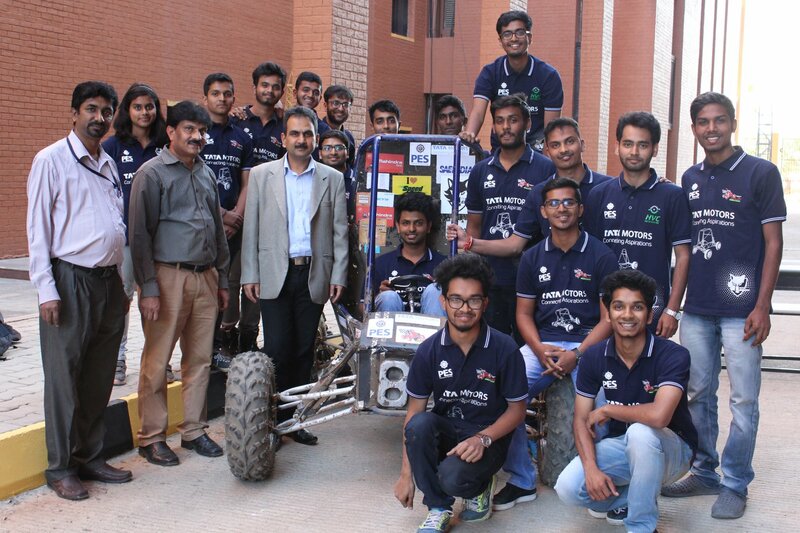 Team Enigma the collegiate automotive club of PESIT South Campus, engineering college at Electronic City, built three cars this year. One was an ATV (All-Terrain Vehicle), Hybrid car (runs on electricity and fuel) and a GO KART to represent PESIT-BSC at various National events. The BAJA division of Team Enigma, built an ATV which represented the college at the SAEINDIA BAJA 2018 event at Pithampur. BAJA is an internationally recognized event. The event is evaluated rigorously by eminent industrialists and experts from SAE on team engineering, design, marketing and management abilities. The Team qualified within the 100 teams out of 400 teams competing for the final endurance race. The final endurance race tests is all about the track event where the vehicles are tested to extreme limits on a challenging terrain. The Team managed to last for entire 4 hours of the endurance race, making it among the few to achieve this feat. Finally, team finished 2nd in the city and 57 place over all. The hybrid vehicle runs on both a 300 cc IC engine and a 2kW motor. As the world is moving towards hybrid technologies, these college students are making a mark in that direction. The hybrid vehicle is able to achieve speeds of up to 65kmph and boosts of various electronic innovative features. The Team also took their car to ISIE Hybrid Vehicle Challenge, held at the Buddh International Circuit, Noida, where they stood 12th overall on a national level. The Team Enigma was sponsored by PESIT Management and also our partners from industry include Tata Motors, Bosch, Brady Co others. The team also participated at International Series of Karting held at Vizag. It was an event where the team was supposed to design and build the GO-Kart. The team participating for the first time won best driver award where our driver Raghavendra Basmi demonstrated extreme caliper and also the team won star of the event award. The events were held in the second and third week of January. The Team had worked on the projects for almost a year. Himanshu Kumar and Anirudh Kashi were the captains for Baja and HVC respectively. The team was guided by faculty advisors; Dr. S V Satish and Mr. Varun Manujunath. The team mentor Dr. S. V. Satish said, “I am delighted by the Team’s performance this year. The team managed to handle the tough tasks of finding sponsors and developing the technical skills required.” Dr. J Surya Prasad , Principal and Director quoted clubs like Enigma encourages interdisciplinary concepts amongst the students and prepare them for real world problems when they enter modern industries. The team said “‘Never give up’ was the main motive of our team. Despite many hurdles we worked hard and it was not just about the event, it was the journey. The biggest achievement of the Team was completing the endurance.” The Team is looking forward for an even greater standing in future events, and shows no signs of losing momentum. Wishing graduating students, a bright career ahead AT-Home 2017 turned out to be a gala event for wishing a bright professional career ahead to the graduating students of BE, MTech, MCA and MBA programs at PESIT Bangalore South Campus. Each department announced the best out-going student. Prof. Sandesh struck an emotional chord by singing “Papa Kehta Hain Bada Naam Karega” and Dr. Subhash Kulkarni rendered another melodious song. Out-going students released balloons to the sky. The junior students put up an impressive dance, drama and musical performance and distributed prizes for achievers and organizers of sports and extra-curricular activities. Another highlight of the event was Memory Lane a short video film which showcased the association of seniors and juniors in organizing various events. 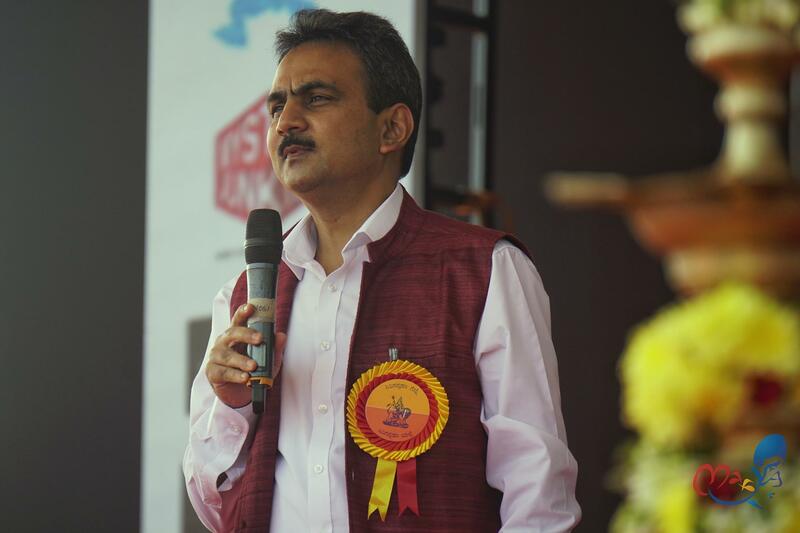 Dr. Surya Prasad, Principal, concluded with the tag line for this year’s event “Yes! You Did It!” The organizibg team was headed by Dr. S.V.Satish and comprised of students: Madhumitha Prakash, Vatsal, Kushali, Sujith, Manas.